Cinemas are going through something of a renaissance of late, with a little thing called 3D bringing the public back to the big screen in their droves. With the launch of Avatar set for 18 December, the UK's cinema chains are geared up for what should be a three-dimensional Christmas. But, with 3D being the norm for most cinema screens up and down the country, what makes a particular cinema stand out any more? There's one thing that's allowing the smaller independent chains to compete with the big boys and that's the advent of digital screens. London saw the launch of its first Sony Ultra HD digital cinema system this week, with the Apollo Cinema chain unveiling the Art Cinealta 4K projection setup to journalists at its Piccadilly branch. The move is a significant one for the whole of the cinema-going public in the UK, as it brings in unrivalled picture quality to the big screen, with it the ability to play 3D movies in the best possible way. At the event there were a number of industry heads and analysts discussing the technology and the industry as a whole. Among them was film producer and politician Lord David Putnam who called the advent of 3D digital cinemas in the UK nothing less than game changing. "The growth in cinema and box-office revenue is remarkable," Putnam explained. "2008 saw £170 million in sales, the best since 2004, and 3D is part of this. There is every indication that when films are shown in 3D and 2D, 3D is favoured by the public four to one. I do believe that in every sense that digital and 3D projection in general is the game changer in cinema." So, what exactly does make digital cinema game changing? Despite the obvious draw of picture quality for the consumer, Putman believes the lowering of costs for the cinemas themselves is also key. "Digital cinema means lower print costs, and the fact you can update trailers at short notice, say in the awards season. This is something that was impossible in the days of 35mm." 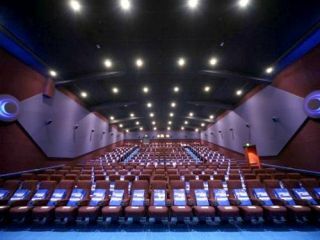 Others in the industry also put cost as a major factor, not for the cinema owners but from the cinema-goers.